A few weeks ago, I took my first class at Yoga Vida in Noho. I signed up for Deep Flow with Dana Slamp and hands down, it was one of the best yoga classes I’ve taken so far. It was 75 minutes of sweat, learning, inversions and meditation. Dana even directed me to my first forearm headstand! Naturally, I needed to know more about her and so do you. I met Dana at Pure Yoga in the Upper East Side in between her classes and we talked about the importance of mentors, balancing our doshas with essential oils and managing screen time. Let’s start with a brief summary of who you are. My name is Dana Slamp and I am a yoga therapist and yoga instructor in New York City. I lead teacher trainings and I teach in group classes. I also treat people one-on-one. And I see you’re from Washington State? Where in Washington are you from? Yes! I’m from outside of Portland, Oregon in a place called Vancouver, Washington, which I lovingly refer as the Jersey of Portland because it’s like over the river and more affordable. So I feel like there’s this battle between “yoga as a mental wellness practice” versus “yoga as a workout”. How do you feel about this and how do you merge those two in your classes? When working with someone one-on-one or even in group fitness, we do have to follow the contract. If the contract is that this is an exercise class, I will teach an exercise class BUT if it’s called yoga it has to have some mindfulness in it and some down regulating aspects to it. The true story is there’s actually no division between mind and body. It’s really a Cartesian phenomenon. It was Descartes that said, “I think, therefore I am”. At the end of the day, it really doesn’t matter if you have a body to mind path or a mind to body. I always care for people’s preference but the mind/body connection that we say we seek is a place that’s natural and can be realized and the process of yoga is to uncover that clean and clear place. Bring it on! If you want to get strong, we’ll get strong. But I will always ask you: what are you strong for? If you want to be attractive, great. What are you attracting people to? Health is not just your body. I always invite students to be curious about what the deeper intention is. I love that! This brings me to my next question: when I took your class you corrected me a couple times, which I like. Some students want to be touched, some don’t. How do you deal with this? Do you even think about whether or not you’re going to approach a student? Oh yes, all the time. It’s really a conversation. And it’s a conversation you’re having on the fly when you’re doing this other thing, which is leading the entire class so there are certain places where you can be focused on one individual. My experience is that students loved to be touched but they never want to be touched quickly or judgmentally. It always has to come from a place of improvement and love. And so, we work at getting the intention really, really clean. And then there are techniques of adjusting. If I just came up to you and said, “move your left knee to the left!” you’d be like, “who is this person?” even if I were your teacher. But if I came up and said, “hello, consider moving your left knee to the left” and then when I left I wasn’t abrupt and didn’t say goodbye, rather, I said my benediction and left respectfully, that would be a successful assist. Do you have a mentor in either the yoga world or your personal life? Do you think it’s important to have mentors? It’s incredibly necessary in yoga [to have a mentor]. 200 hours is never enough. When you start teaching and you realize all there is to it and all the different parts of your mind you have to use to be the best teacher and bring out the best in your students, you immediately know that you need a mentor. I was mentored originally at Sonic Yoga by a teacher named Jen Whinnen. She now runs Three Sisters Yoga, which is another place I teach. Other mentors of mine that have really held the space have been Dana Flynn. Dana taught me a lot about creating community and creating a mindful flow that gives people that meditative, sweaty flow but is healthy and safe. My yoga therapy mentor is Guru Dharam. Guru Dharam taught me (and it was a lot of work) taught me how to be more neutral so that I didn’t get too emotionally involved or thrown off my base if a student was having a bad day. Now I can hold the space for people to have their transformation while remaining personally impersonal and positively neutral. I don’t know if that makes sense? Yeah, I think so. Basically, you have to go into class and focus on your teaching, right? Yes! We’re there to hold the space and keep it safe so they can have their transformative experience. I will give you the techniques and I will tell you the scriptures as they’re written, if it’s appropriate for the class. The better that I can be at remaining neutral, paradoxically, the better cheerleader I become for bringing you closer down the path to your goals. I saw that you did a #digitaldetoxday, which I really admire. How do you decide when it’s time to step away and is it hard to stay away? Thank you for asking because I want to cultivate my teaching on this. At this point, I’m learning how to be a better student in digital detox before I can teach it. It’s like the rest of yoga; it’s about a mindfulness. Mine usually starts off in my body where my eyes start to get tired or I feel a constriction around the middle of my chest that I know I’ve had too much stimulus, too much stress and I’ve taken on too much. I’ve learned to listen to that and that’s when I do a digital detox and it is AWESOME! Very difficult though, because just to figure what the yoga schedule is, it’s all online. 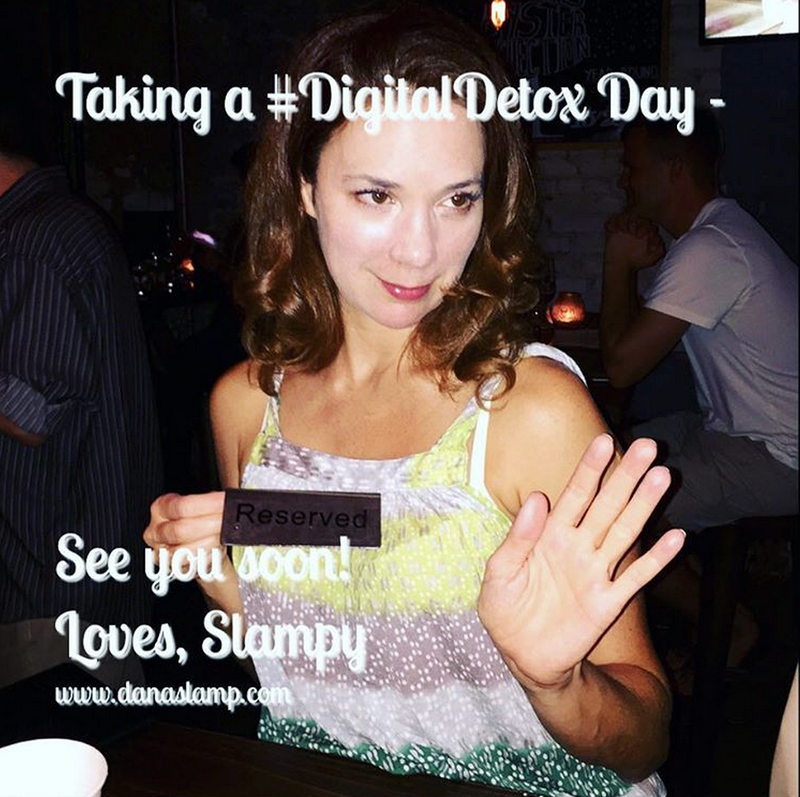 So, you have to plan ahead and making that [Instagram] template was great and I’m going to do it again because everybody understood and secondarily, I think it encourages others to find days where they can digital detox. Prema Yoga Therapeutics, the school I founded, has a scholarship called Care for the Caregiver, which brings caregivers (yoga teachers, nurses, social workers, mothers), into our trainings. Ultimately, we’ll expand this program to other studios. That’s in the preliminary talks so I can’t give too much away! But first, I’m working on taking my digital detox days. You’re not alone! I think a lot of us are trying to find that balance. Do you have a specific daily habit that you think contributes to wellness over time? Sure! I practice this thing, Abhyanga, which is oils. I put a mix of sesame in the winter or coconut in summer on my body and it’s mixed with essential oils that are good for balancing my dosha. It’s awesome! Oh nice! So how does it work? So you ideally put it everywhere. When you get out of the shower, towel off so that you’re still damp and you’re in that 2 or 3 minutes where the moisture is still in your skin and apply the oil on so it helps retain the moisture. At a joint, you circle and at a long bone you stroke up. It’s really good for relieving dry skin. It’s a really loving thing to do and it brings you to the senses and it grounds you. I don’t even know if it’s believable but I’m telling you from experience that it works! I believe you! One last question: if you could do one pose for the rest of your life, what would it be? HA! A handstand – I love handstands! You can follow Dana on Instagram @danapremayoga and on Twitter @Slampster. A roundup of some of my favorite health and wellness articles and stories! From recipes to life advice to athleisure, there's something for everyone. Link in bio. Practicing my crow pose while listening to my post-workout playlist. Head to the link in my bio to see what I've put together on @Spotify! Fueling up before @yogavidanyc's Inversion Immersion workshop today! Who else will be there? Working from a rainy North Carolina today 🌧🌧🌧 On the flip side, NEW POST is up!! I talked to students and instructors about what we can do to improve the group fitness experience for everyone. Link in bio.